According to Saudi officials, a stampede outside Mecca has left at least 200 dead and hundreds more injured Thursday during Islam's annual Hajj pilgrimage. BBC News reports that around 400 people were hurt in Mina, roughly three miles from the holy city, after being crushed in the stampede. More than 2 million Muslims from all around the world are estimated to participate in the celebration and take the sacred pilgrimage to Mecca this year. Authorities said rescue operations were currently underway, and casualty numbers are expected to rise. According to CNN, the stampede took place on the first day of Eid al-Adha, or the Feast of the Sacrifice, during a ritual called "stoning the devil," during which pilgrims throw small stones and pebbles at massive rock walls to symbolize their rejection of Satan and evil. The Hajj is the fifth pillar of Islam, and every adult Muslim is expected to fulfill the pilgrimage at least once in his or her lifetime. The pilgrimage is held over five days and include a wide range of rituals such as wearing white garments and sacrificing animals to commemorate Biblical events. The "stoning the devil" ritual is considered the most dangerous stage since massive crowds are funneled past Jamaraat Bridge. With the huge influx of people into Mecca, stampedes and the lack of crowd control have led to a number of incidents over the years. One of the most deadly in recent memory took place July 2, 1990, when a stampede in a pedestrian tunnel from Mecca to Mina led to 1,426 deaths. The last stampede to occur was in 2006 and during the same stoning ritual. That incident left more than 300 dead and hundreds more injured. In recent years, Saudi officials have sought to expand religious areas to better accommodate the mass crowds so many areas of the holy city have gone under renovations. But even those attempts have led to dangerous circumstances. Just two weeks earlier, more than 100 people were killed in Mecca after a construction crane fell at the Grand Mosque. 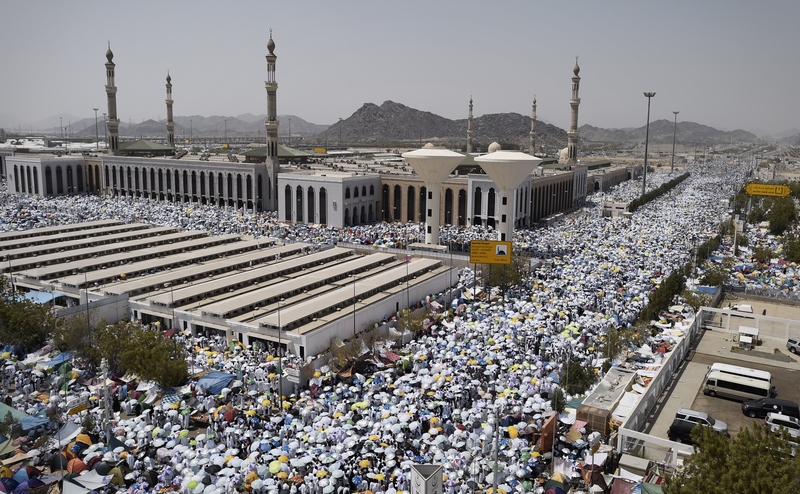 People had gathered there in anticipation of the Hajj.